Discussion in 'WIP (Work in Progress)' started by Artesia, Jan 10, 2009. -First team to reach 100 Production Wins. -Command Points earn Production over time. -The intelligence resets 30 seconds after capture. -Enemies near your CP will prevent the Intel from being captured or Production from being earned. Including cloaked/disguised spies. -Fixed timer! The timer that was counting down to nothing happening has been replaced. It now is counting down an estimate of when the game will end at the current CP status. Capping the intel will remove time (if the capping team is in the lead) as there is less production to earn to win, therefor less time. Additionally right below the timer is text stating who will win in that amount of time if the CPs remain under their current owners. -Instructional Overlay in both Main Spawnroom, same text as above. I still have it in the welcome screen but no one reads it so I added it here so people can go back and read it if they need to. -Added connecting path from catwalks between points A&B and C&D. -Adjusted lower wall of both huts to give line of sight from all CPs to all 4 sniper perches on catwalks in the center (going across diagonally). Noticed with the addition of the final 2 game_text channels, that the production score occasionally flashes, I can't seem to stop this, if anyone has any thoughts let me know, it is rather small so I won't lose sleep over it. Looking forward to being able to start texturing and detailing. still needs balance testing. This map would probably fare better as an arena map, really. The size is just right, and the extra points seem unnecessary. The gameplay is alot like Rocket Riot, as it's a playon of dom that helps balance it to teams getting back from being behind. It is a weeee bit small for Rocket Riot gameplay though . Where would you cram a rocket in? It's not designed as an arena map. Just because its small doesn't mean it has to be arena, could also mean its mean for lower player numbers. You obviously don't understand the concept Cerious if you think the additional points are unnecessary. I have not interest in making arena maps. I'm not going to convert this to "rocket riot" I see no reason to pigeon hole my map by forcing a rocket into it. Why would I convert it to someone else's gametype when I have my own I'm working on? Also from what I hear its not like rocket riot (I think that name sounds lame btw) except for the fact that CPs earn points over time like DOM. Also you shouldn't name a gametype something that will limit mapping possibilities... You're basically saying every map must have a rocket in it, which I have no interest in seeing, would likely get old after 2 maps. This was originally just a test map for cp_pyrite and I wasn't going to do anything with it, but we've had lots of fun playing it so I've been working on it to make it better. 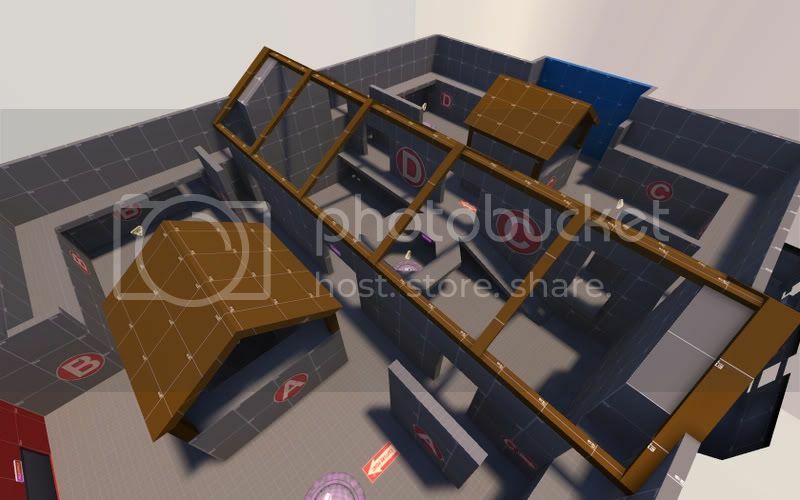 This map is for 6-12 players, not 24 (although I'd be interested in seeing it played with 24) Pyrite will be far bigger, a different style of gameplay for a full 24 players. It's based on the gametype from Multiwinia. L2Google properly j/k. There is nothing wrong with Rocket Riot - I love it. But this map (I agree) would be better as CP. Looks nice. If this map is meant for 6 to 12 players, good luck with that. Most servers have players of 24-32, finding a smaller number means you'd need either some kind of bball2 server or a dead server. I got bored one night and let people upload it on their servers, and we had a lot of fun. 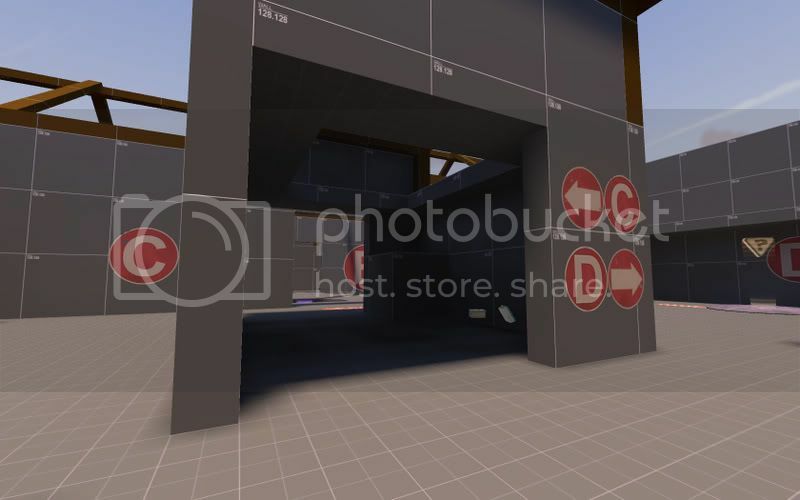 So I continued to develop the map at that same size, still meaning to complete cp_pyrite and full scale. We all agreed that the server wouldn't work well on a normal server's map rotation, but that it was really fun and might work well for a "server filler". IE a fun map to switch to while you get the players needed to have fun on bigger maps. What other maps can you have fun on with only 6 players, with so many geared towards larger numbers. Because they are geared towards most players, if the number gets too low, the action is spread out so thin it gets boring and even more players leave, then you have an empty server. It was never my intention to release this, until people liked it, and we didn't need a full server. We started playing it 2v2 and people joined, next thing I knew we were playing 6v6, the other 8 people being randoms that joined the server, and said they liked the map. I think thats doing pretty well for a "test server" used to test WIP maps by GrimGriz and SexualHarrassmentPanda. (Both have servers with some version of this on it). 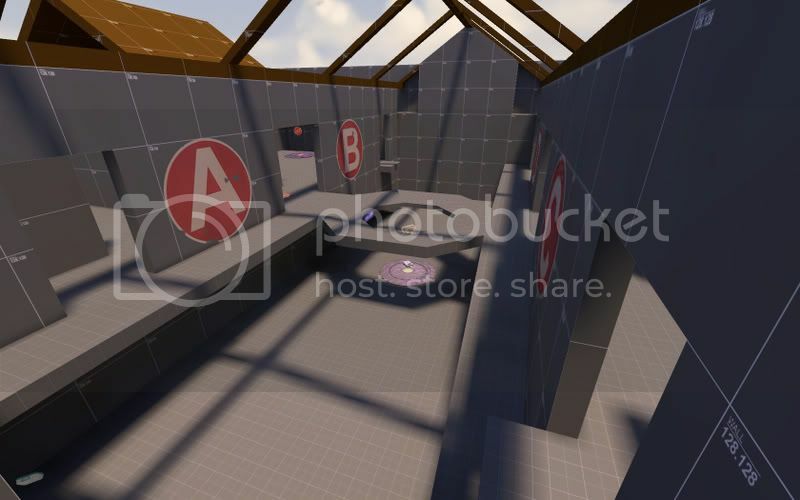 Anyways, I'm developing this gametype more in this map, and will then copy it over to cp_pyrite which is the true fullscale map I had in mind for the gametype. Objective is to obtain 100 production before the opposing team. Production is earned by holding a Control Point over time. 1 Production for every 30 seconds. There are 4 Control Points. Additionally there is an intelligence located in the map's center, this can be captured at a non-contested friendly Control Point for an additional 3 production. Each Control Point has a respawn room associated with it, upon death you will respawn at the nearest friendly Control Point. If you have no Control Points, you will then respawn back at your starting spawnroom. Each spawnroom has a main exit going straight out to its associated CP. But there is also an alternate escape tunnel to help bypass spawn camping, located either at the back or to the sides of the spawn room. These "escape tunnels" are not expected to have much action, but rather exit into either a side tunnel (Tunnels connecting point A to C, or B to D) or to a main spawn (if you at a CP on the side of the map your main spawn is located, otherwise you won't be able to take that route due to a visualizer). The escape exit doors from Red or Blu are one-way only, except in the case that the enemy team has all 4 Command Points, the doors will then become 2 way doors until your team takes a CP. Engineers cannot build in escape tunnels, nor can the intelligence be taken into them. 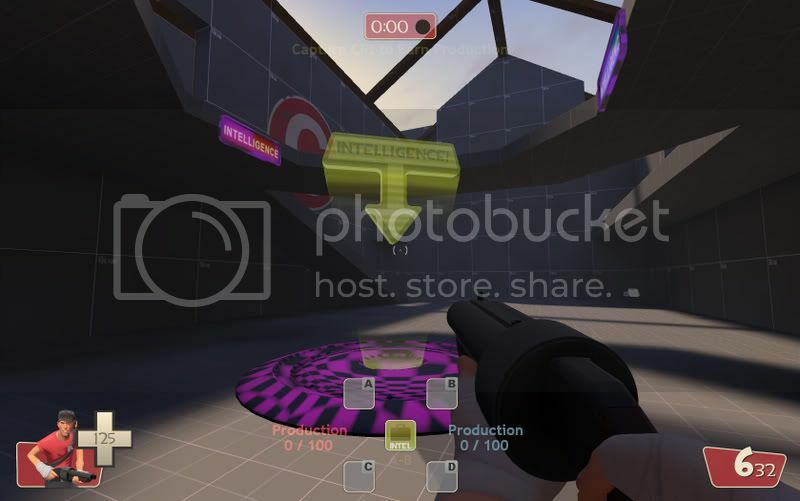 The HUD is laid out in the orientation of the map, the Center CP icon is for the intelligence, and will change color when a team is carrying it. Engineers can manage to get up to the upper levels of the shack, and can jump across and place teleporter exits on the side catwalks. There has been some concern that it may be too hard for engineers to do so, and may give soldiers and demomen an unfair advantage. This will be playtested, and a stair entrance to them may need to be added in the future. Variable spawn times - the more CPs you have the longer your respawn time, I'm doing this to try to make taking all 4 CPs less of a desirable option, and make teams balance between how many CP's to hold, and whether or not to run the intel. This will also make it easier to make a comeback. Intelligence Tracking - Currently I have popups telling players what zone the intel is, on this scale of map there isn't much time to react. Currently playing with several options to make intercepting the intelligence more of a viable option. Intelligence production value will also need to be tested and perhaps adjusted once it is more easily tracked by the opposing team. Instructional textures - no one reads the screens before they play, I plan on putting very basic instructions on the wall of Red and Blu's main spawns. Overlays - Escape Tunnels currently have no directional signage, making it confusing as to where you are going to exit (whether it be near the CP you're closest to or into your main spawn) these will be added, but isn't a big deal as there are plenty of signs in the gameplay area. Capturing intelligence gives you 3 production (5 seconds capping as scout) and holding all 4 cps gives you 1/10 seconds? Because this is a very fast map maybe you should make the cps faster to capture and produce more. Give the intel only 1 production/capture. Why does capturing flags remove time? Map size: This wasn't my intended map for this gametype like i said before. the escape tunnels were added to get around limitations of this map size. 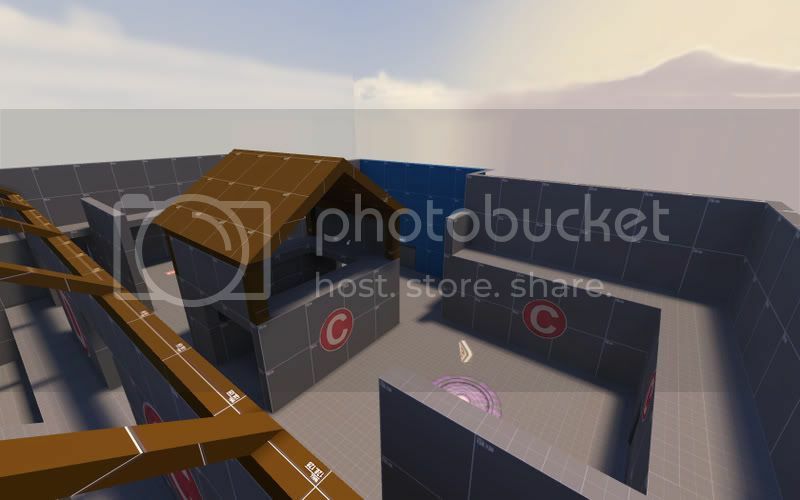 We had enough fun on this map with just a few people that I decided to work on this in addition to cp_pyrite which is planned as a full scale, full player version of this gametype. 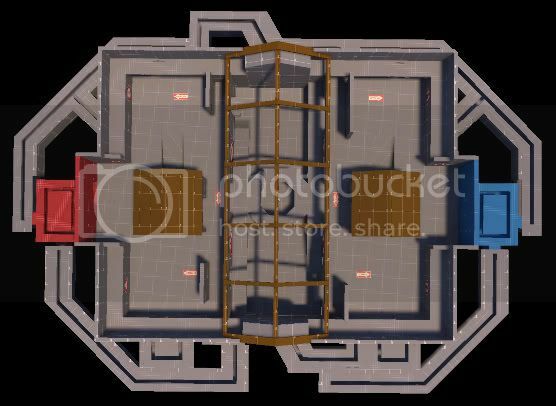 I don't plan on making this map bigger, just leaving it designed for less players and taking the gameplay to cp_pyrite for a full server map. as for the scoreboard, I don't have a readme yet I also need to credit A Boojum Snark for the spawn system. I had been using my own scoreboard more like the one in canalzone but someone turned me on to yours. I didn't realize before that my old scoreboard looked bad on non-widescreen monitors. If you want me to credit you for copying 14 logic_cases from your scoreboard map I sure will. (the other entities are from my old scoreboard I just changed values to work with the cases). Of course I will simply credit you for the scoreboard system won't go into idiosyncrasies on what parts of it I actually did use. BTW, I was afking and when I came back I was stuck outside the map, with a blackscreen (the spawn system?). I had to noclip back to the map. one thing I noticed about the spawn system that might be causing issues is running into spawn rooms at the map end to kill people teleports you... easy fix... The spawn system needs to be predictable, not just random. You should respawn at the closest CP to where you died. which is why I'm using Boojum's system. without it, it would be all random and I don't want that.. I've seen a few bugs with it, but nothing recreatable which doesn't help me figure out what is happening... When you were spawned outside the map, were you below the map a great deal? could you see the level at all? there is a spawn room down there textured in black and you should be teleported out of it. Wow. That looks (and sounds) awesome! I've spent the last 2 days working on custom CP models for the center CP, and I finally got it to work! It's still not final, and there's more work to be done, but just having everything working and figured out makes it 99% done! here's a screen of the neutral model, red and blu will have a different model, but don't currently (right now they just have a recolored version of the neutral). also the color of the text and model might change... to be more readable. Wow, the intel cp is awesome! And the gametype sounds great.....I wanna play it! woke up this morning and tried to boot up my PC, it kept freezing on post. I cleared the CMOS which enabled it to post, I knew my bios was out of date so I tried flashing it using Asus' EZflash 2 utility which I've used before and it worked... this time, it didn't. So now I have a $3000 dead computer and am posting from my wife's really slow PC. I've mapped on this PC before but I'll have to move my drives over to get all my files. Not to mention all my college homework was on my PC. I've called Asus who should be sending me an email to RMA it, it's not even a year old. So yeah, might not get too much done in the next little while due to my PC, and my wife will be having our first child in the next few days as well... anyways... great fun.